Apple updated its Environmental Initiatives website and has issued its 2014 Environmental Responsibility Report today. Today’s update fulfills a promise from Earth Day in which Apple said that it would more frequently update consumers on its environmental progress. Apple has always been focused on the environment, but it has pushed its attention to new levels with the hire of former EPA head Lisa Jackson last year. 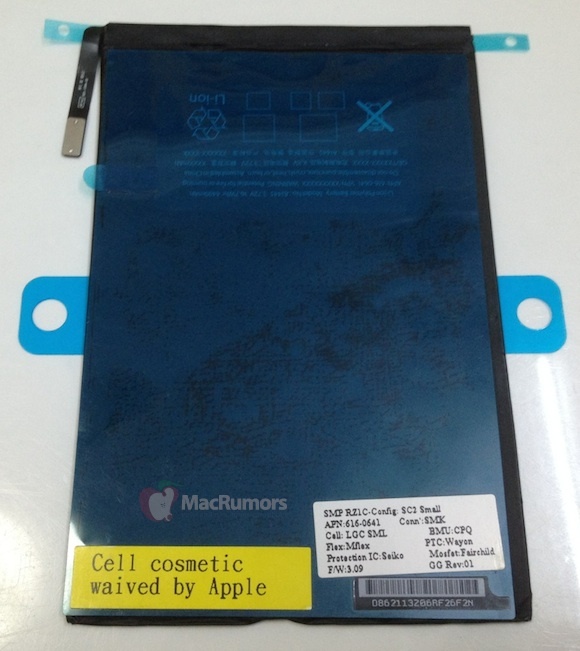 If the 16.7Whr/4490 mAh iPad Mini battery images that MacRumors reported last night are authentic, it would place the power at almost exactly three times more than the iPhone 5’s 5.45Whr and one-third of the massive 42.5Whr battery of the third-generation iPad. Seems pretty logical. The battery runs at 3.72 volts, and it shows a model number of A1445 and an Apple part number of 616-0641.